Many issues saw strong support from well over a majority of those who responded, from studying how unfunded mandates affect property taxes to providing treatment to those with epilepsy with cannabidiol oil to creating more transparency in campaign finance laws. Most answered that tax reform should be the legislature’s main priority for the next session. Property taxes were the greatest concern of those who responded. K-12 education was the state service most valued by respondents, with roads following close behind. Over three-quarters of those who responded said that reforming and streamlining DHHS was important for next session. On Friday, November 7 the Urban Affairs Committee held a hearing on LR 555, an interim study resolution I introduced examining issues facing citizens who live in a sanitary improvement district. A sanitary improvement district, or SID, is a type of political subdivision unique to Nebraska. It is used primarily in urban areas to facilitate growth outside of city limits. Using SIDs in this manner ensures that new infrastructure development is paid for by those who will benefit from it, and that residents in the center of the town are not subsidizing growth on the outskirts. In Sarpy County, there are 111 sanitary improvement districts. Most SID boards contract for basic services like snow removal and garbage collection, but SID residents often don’t realize that while their street address might say Bellevue on it, they can’t access many city services such as the Bellevue Public Library or code enforcement as residents. The hearing examined these issues (access to city services, voting) and several others facing residents of sanitary improvement districts. I especially appreciate the hard work of committee legal counsel, Trevor Fitzgerald, in helping to organize the hearing. Yesterday, I testified in front of the Judiciary Committee regarding LR 433, an interim study resolution I introduced to examine issues surrounding the compassionate use of cannabidiol (CBD) oil to treat patients with severe epilepsy. CBD oil is a substance that is low in THC, a psychotropic component that in large quantities produces a high. Research published in peer reviewed journals found that CBD oil helped minimize seizures with few side effects. We are working on a bill for next session to allow access to CBD oil that is low in THC for patients with intractable epilepsy who are willing to participate in a research study of its effectiveness. This is a very narrow approach that focuses solely on low THC product that is legally equivalent to hemp by federal law. Most importantly, the hearing allowed parents of children with severe epilepsy to share their stories with the Judiciary Committee. I am grateful to the parents who traveled to Lincoln to participate in the hearing yesterday. My heart goes out to these brave families who so desperately want to reduce the seizures of their children. One way I communicate with constituents is through social media. Beginning this interim and continuing next session, our office will share an infographic with information about hearings scheduled that day and bills scheduled for floor debate along with a link to listen to the proceedings online. If you haven’t already, I encourage you to like (hyperlink to FB page) my Facebook page and follow (hyperlink to Twitter) me on Twitter. During session, I will post a “Today in the Legislature” infographic once a day as a way for constituents and others to track what’s happening in the Legislature in almost real time. The Nebraska Unicameral has a long tradition of transparency and open government. I hope this feature will assist us in bringing additional transparency and accountability to the work we do in Lincoln. The 104th Legislature is scheduled to convene on Wednesday, January 7th at 10:00 AM. Due to term limits, we will have 17 new senators and a new gubernatorial administration when session commences early next year. 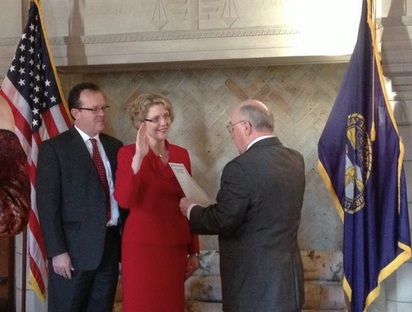 Photo of me taking the oath of office in January 2013. On the first day of session, these new senators will take their oath of office. The Legislature will also elect a Speaker and chairs of the standing committees. Senators will also receive their committee assignments from Committee on Committees members. In Nebraska, senators can introduce bills during the first 10 days of session. Executive Board committee members then reference bills to the standing committee that has subject matter jurisdiction over the bill. In Nebraska, unlike many states, each bill receives a public hearing. These hearings will begin in late January or early February once all bills have been referenced to their respective committees. Stay tuned next month for a preview of my legislative agenda for next year!